Astronomers have pinpointed the location of mysterious signals which have puzzled experts and fuelled suggestions they represented signs of alien life since the first powerful cosmic radio blast was detected over 15 years ago. The first of such signals, a 5-millisecond radio burst dubbed the Lorimer burst, was discovered in archived data taken in 2001 by the Parkes radio dish in Australia. 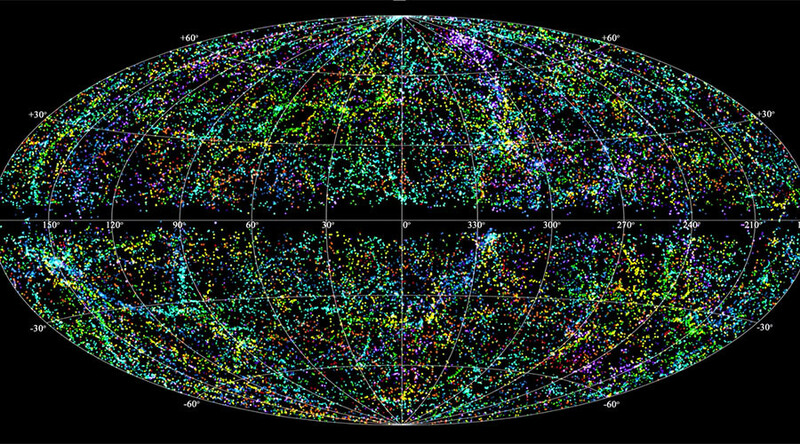 Since then, more than a dozen fast radio bursts (FRBs) have been detected in telescope data. The nature of theses radio wave blasts is to last for just a few milliseconds, occurring as one-off events with just a single burst recorded from a single location. They can emit as much power as 500 million suns. Until now these elusive FRBs have never been traced to their origin and scientists have been left baffled by the strange signals. New research published in Nature , focusing on the only fast burst known to repeat – FRB 121102, has shed light on the intriguing phenomenon. FRB 121102 was first detected in 2012 in the constellation Auriga and has reemerged a number of times since then. A team of astronomers used a number of radio telescopes to detect multiple bursts of FRB 121102 and narrow down its location. The Arecibo radio telescope in Puerto Rico, the Karl G. Jansky Very Large Array in New Mexico, and the European VLBI Network across Europe were used in the process. They discovered the bursts originated from a dwarf galaxy some 3 billion light-years from Earth and emit faint radiation in both radio and visual wavelengths. The Gemini North telescope in Hawaii was used for a follow up observation and showed that the galaxy was less than one-tenth the size and has only about 1 percent of the mass or our Milky Way Galaxy. The Gemini observations characterised the corresponding host galaxy “and for the first time with an FRB, left no doubt about its origin," according to one of the study’s authors Paul Scholz in a statement to the Gemini Observatory. 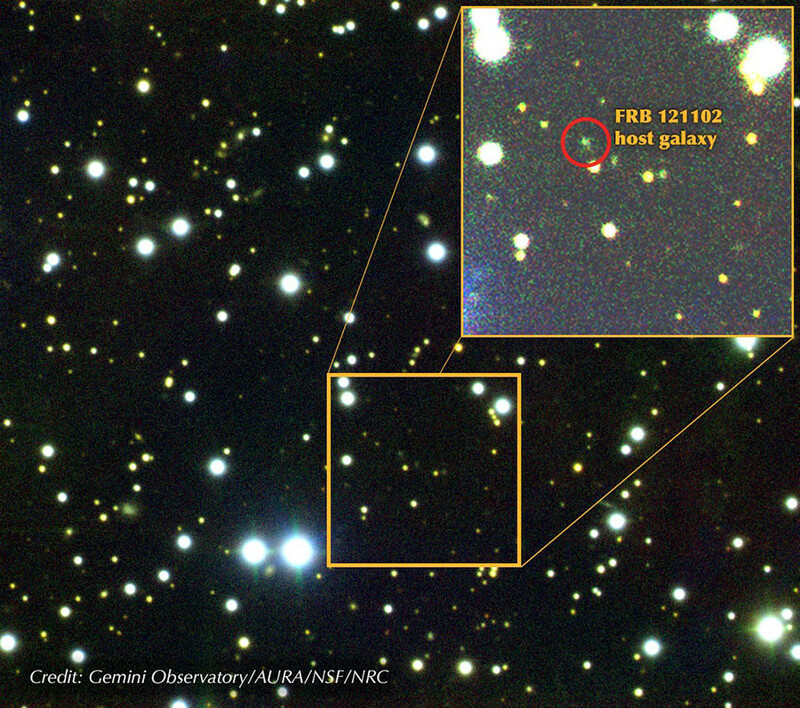 The fact that dwarf galaxies have less stars than many galaxies also makes it a surprising home for this fast radio burst. "One would generally expect most FRBs to come from large galaxies which have the largest numbers of stars and neutron stars,” Shriharsh Tendulkar said. Neutron stars are remnants of massive stars and are one possible explanation for the FRBs when you combine their presence on dwarf planets with long duration gamma-ray bursts and superluminous supernovae, according to the team. "This discovery may hint at links between FRBs and those two kinds of events," suggested Tendulkar. While this research is a major step in gaining a greater understanding of FRBs, the cause of these fast radio bursts still remain a mystery. “What we learn from these papers may not be applicable to FRBs more broadly,” Peter Williams at the Harvard-Smithsonian Center for Astrophysics told the New Scientist. “It is possible that FRB 121102 is special and that most FRBs are of an entirely different, non-repeating type." Astronomers are hopeful that a new groundbreaking radio telescope, CHIME, being launched at the Dominion Radio Astrophysical Observatory in Canada, later this year will help shed further light on this puzzling phenomenon but until then let us know what you think is behind these flash in the pan signals.